Fixed broadband and mobile broadband provider NetZero recently launched Sprint powered mobile phone service. 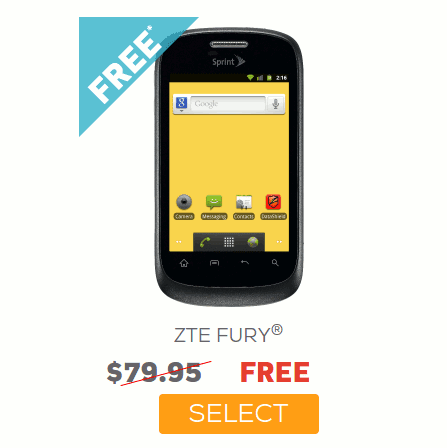 A selling point with NetZero is that they are giving a free ZTE Fury LTE Android phone (reg $79.95) to new customers who pay in advance for six months of service on any NetZero plan priced at $25/month or higher. There's a $6.95 shipping and handling fee and a $20 activation fee, making the total cost of the "free" phone and six months of service on the $25 plan $176.95. Like most unlimited prepaid plans today, data on NetZero's $39 and higher plans is actually unlimited. After the high speed data allowance is used, unlimited throttled data is available for the rest of the plan month. According to Net Zero, throttled speed is 56 to 128 Kpbs. NetZero's plans are reasonably competitive with other Sprint MVNOs (see Sprint and Sprint MVNO Prepaid Plans Compared). However they are not at all competitive with Sprint's own prepaid brands, especially Boost Mobile, which offers unlimited Talk and Text and 10 GB of high speed data for $55/month (or with 5 GB for $45 or 1 GB for $35). I have to wonder how any Sprint MVNOs are going to be able to stay in business when Sprint itself is offering two to five times as much data for the same price as any of its MVNOs. The only thing Sprint MVNOs like NetZero still have going for them is that they allow customers to "Bring Their Own Sprint Device" (BYOSD) with relatively few restrictions compared with Sprint's own prepaid brands. NetZero can activate all clean-ESN (not financed or reported lost or stolen) Sprint phones except models released in the last 12 months. Besides the ZTE Fury, NetZero offers a small selection of Android phones including the Samsung Galaxy S III as well as the iPhone 4s, both priced at $199.95. Update 6/23/2016: NetZero no longer offers mobile phone service. Boost Mobile device release: ZTE Speed for $99. Data speed 56 kbps is like not having data at all. Practically useless. Ting was going to let me activate a virgin optimus f3 recently. Have Sprint dropped prepaid phone activation restrictions? The platinum one costs more than the Cricket $50 deal (which also works with BYOD), has less data, and a worse network with much worse coverage. I can't imagine choosing this. At $35 instead of $55, though, it would be OK. I have to say Sprint will lease their service out to the proverbial two cups and a string if even they wanted to start a new MVNO!!! NetZero's $25 plan has a hard data cap. Unlimited throttled data is only available on the $39 and $55 plans. Which makes sense since the $25 plan doesn't include unlimited talk and text either. You're right. Thanks for pointing that out. I've corrected the post. Not compelling in a very competitive space. Sprint based plans, like TMobile plans, have a major handicap compared to the others due to the deficient, much smallet network. Plans on these can find market success by offerino a lot more data, and for a lower price, than the Big guys. These NetZero plans end up offering less value than plans running on the two much better networks, and make you pay more for them. However, after looking at Dennis' low usage plans, RingPlus lowest plan is not bad. I got a ton of old Sprint phones lying around from yesteryear. Right. And RingPlus will sell you roaming on Verizon for 14c/minute and 55c/mb for the few times people do not have Sprint network coverage. As long as we realize, Anon,that the "few times" could be a lot. Sprint has about half the coverage area of Verizon, and there are large regions of the country easily covered by Verizon where Sprint is but a pipe dream... the same as the situation with T-Mobile and AT&T. Sounds like you were brainwashed by all those Verizon ads. The court told Verizon to stop using the outdated competitor maps. And it doesn't matter whether Sprint and T-Mobile don't have service everywhere as long as they offer roaming. Don't be fooled and waste your money based on dumb commercials, folks. There's no roaming on NetZero. No "brainwashing". I rely on accurate maps from those other than Verizon. Neutral sources. And the roaming doesn't cut it: many do not offer it, do not have data roaming, or only have limited roaming. Verizon and ATT based MVNOs and plans have significantly better coverage. That's just the way it is now. Boost Mobiles' Promotional Plans are now Permanent. Boost Mobile has better free phones including the LG VOLT which sells for $179.99 regular price. Free phones are only in store promotion. wow! what an offer! they are giving a free piece of junk phone, and the only catch is i have to sign up for 6 months of crappy sprint service? lol.